Friday Office Funnies – Is Area 51 Real? omg – that cartoon is too funny. Who can’t idenitfy with those missing socks. I even tried tying some socks together to avoid losing one and beleiove it or not that didn’t work. How clever. That’s pretty funny. 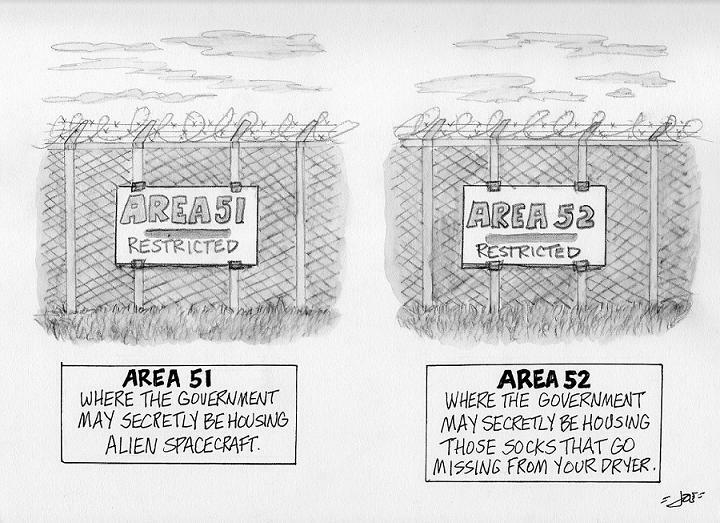 Is there an Area 55 where aliens like to dance around wearing the lost socks of the world? So true-the best part is finding that sock in the stangest places leaving you to wonder-how it ever got there.